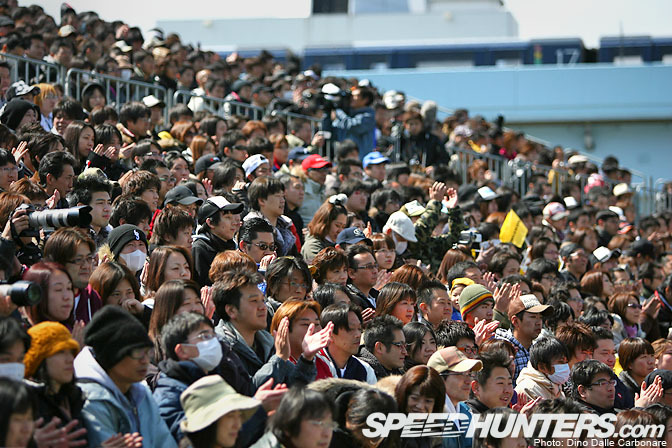 D1 really captured the Japanese capital over the weekend with packed stands on both Saturday and Sunday. The TV Tokyo crews came out to film the action and behind the scenes for a special show which will be aired later next month. I know I probably say this every year but the level of driving seems to increase so notably as this form of motorsport progresses, especially in the precision department. I have never see so many barrier-clipping runs at Odaiba! Still driving his trusty old ER34 Nomuken is one driver who felt confident at this first round, struggling a little to find his game earlier on Saturday but nailing a couple of close-to-perfect runs during the of course of the weekend. 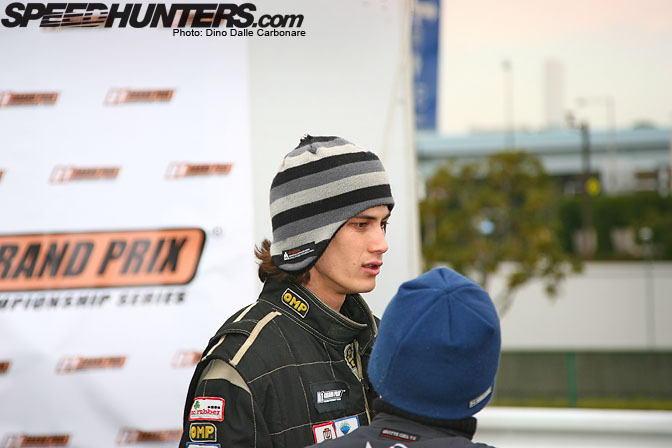 If there is one driver who deserves a special mention it has to be Orido. After struggling all last season with the Aristo his new Supra seems to be precisely what he needed to find his long lost mojo. He was killing it with smooth sponge-barrier-scraping entries, followed by aggressive exits where he proceeded to use all 700 HP his 2JZ develops to vaporize the Advans! The crowds were loving it! 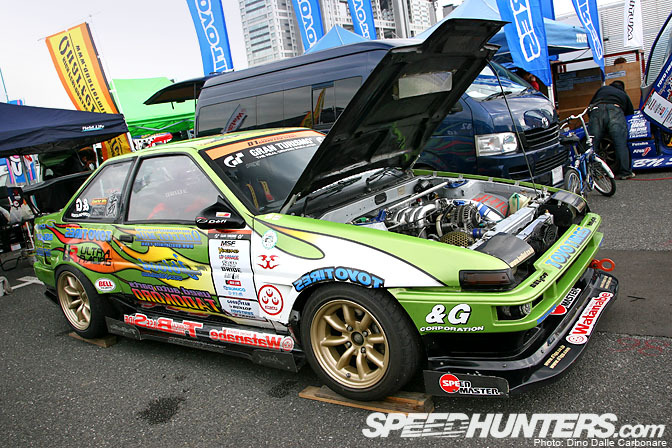 Tadokoro's rotary-powered AE86 is one of only two hachirokus that were entered in this first round. 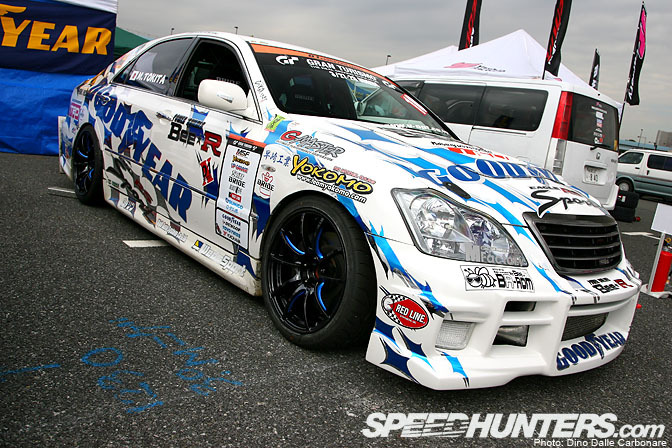 The other was of course Hibino's Up Garage sponsored Droo-P car. The 13B sounds so smooth when bouncing off the limiter around the track. Hope to see more of this car this year, gambatte Tadokoro-san! 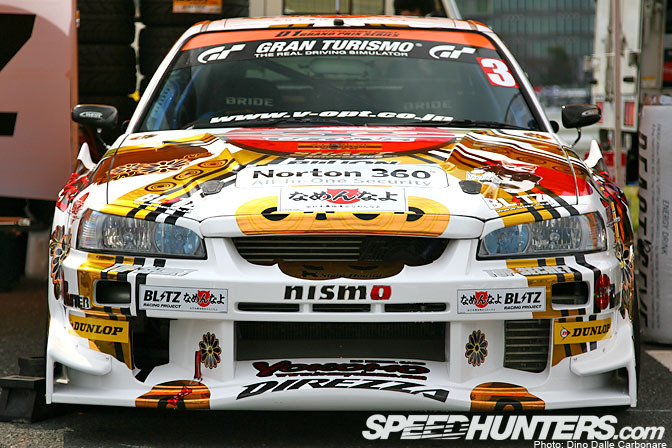 A closer look at Imamura's S15. The black Weds SA-55Ms couldn't look better on Tokita's car, the coolest grandad Crown in Japan! 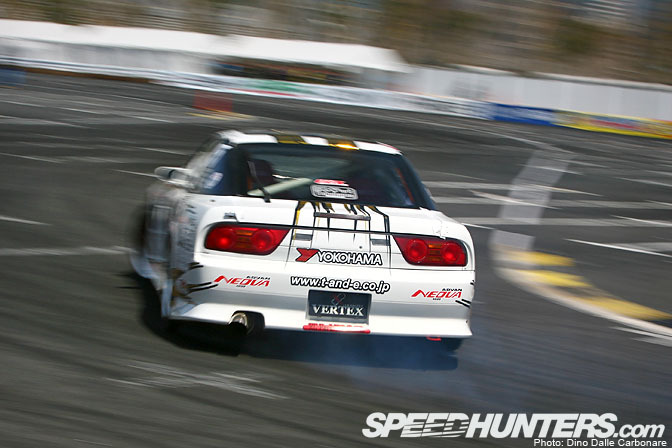 …which started off with Matsukawa smashing the front end of the freshly repainted SC430 during his qualify run. He then had another close encounter with the same barrier while leading the tsuiso battle against Orido. 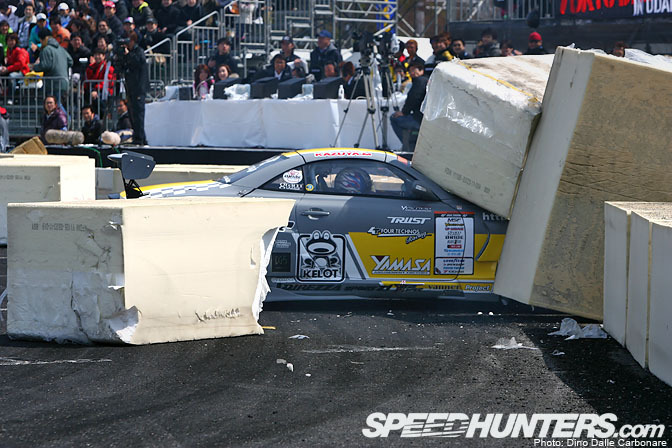 Hibino ended up ripping the whole corner off his AE86 on Saturday as he got caught on one of the concrete barriers while going into the first corner. On Sunday his diff gave up just as he was flicking his car sideways in the short straight leading into the judged corner. I'm sure they will have more luck next time. 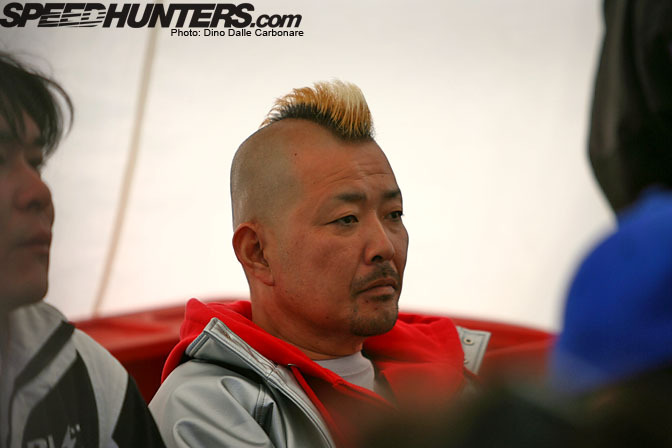 Kawabata in his Toyo Tires S15 was the first driver to put down a perfect 100-point run during qualifying, and ended up making it all the way to the semi-final where he lost out against by Imamura. 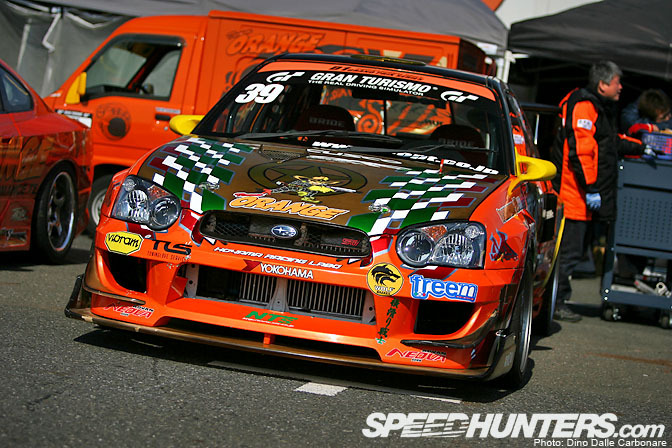 This is Federico Sceriffo's Team Orange Impreza. It's actually Kumamiubo's original 2006 championship winning car. I followed the build of this car at JUN in 2005, back then one of the most extreme D1 projects ever created. 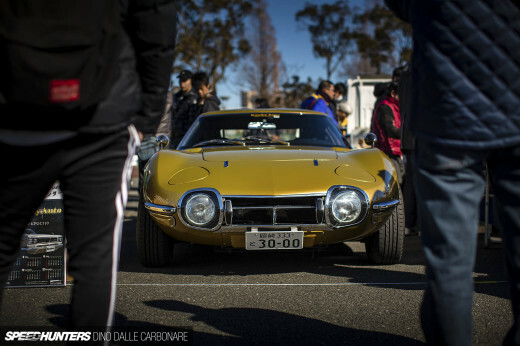 It was built by "God Hand Koyama" who has now converted the car to LHD so Federico can feel comfortable driving it. Pollard in action with the T&E 180SX. I really hope all the foreign drivers come back to as many rounds as they can participate in this year, it certainly makes for a more exciting and more international feeling atmosphere. 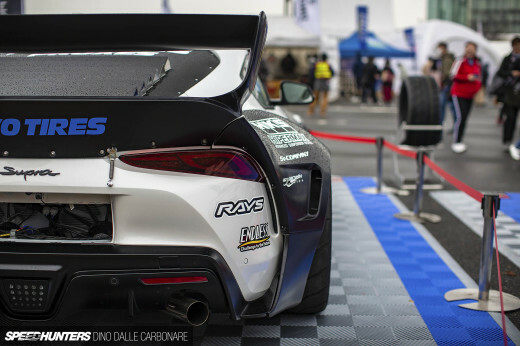 I think the Bee-R guys turned the Bee-R Limiter off for Odaiba as I didn't hear the GT-R backfire once! How about that for some close action! 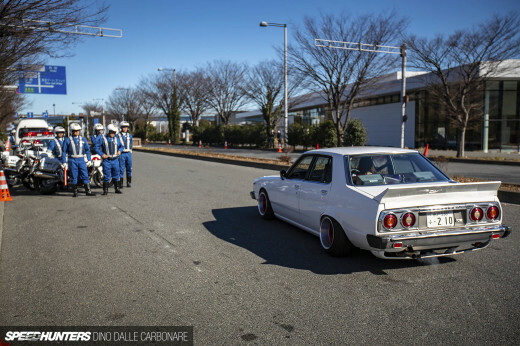 You have got to give it to Hibino, he manages to get more than 100% out of his AE86 keeping up with cars running more than twice the power of his 370 HP Trueno. What better way to take a brake from the smoke-filled action than by grabbing a tasty crepe. 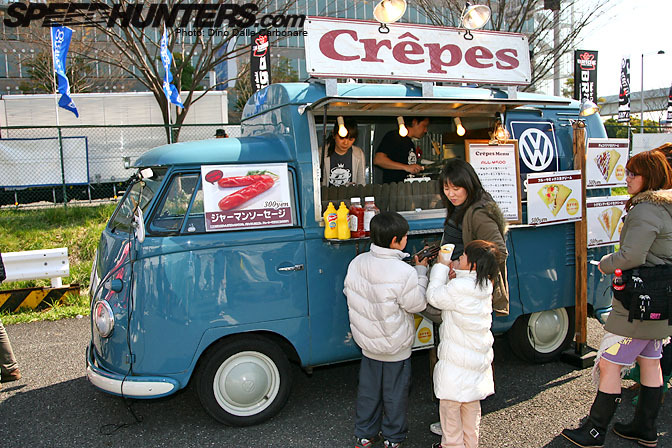 Check out the mods to the VW camper van that have transformed into a creperie on wheels! Orido took out Kazama's IS for a few demo runs to promote the Gintama manga. He was wearing a white wig to look like the main character in the comic. Forrest Wang chatting to the T&E guys in the pits. A little sneak peak at the engine in Orido's JZA80. Can't recall if I have ever seen an intercooler placement like that in a Supra before. Very cool! Takayama in action. The R-Magic guys are not sleeping much these days as on top of providing support for the D1 RX-7 they are frantically getting the Time Attack machine ready before it's shipped out to Australia for the Time Attack Challenge in May. You really can't beat the views in Odaiba. 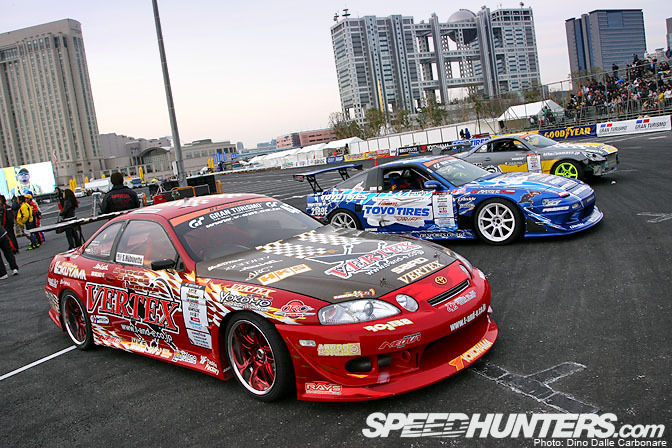 This is Hübinette's Soarer lined up at the end of the day after Imamura and Hibino received their prizes. …as well as checking out what went down during Sunday's All Star match. Great to see the cars in action. 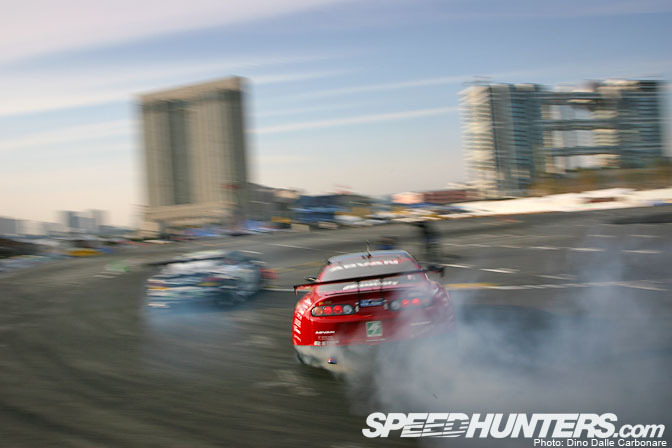 Great Pictures aswell, love the third (Supra) one. Dino: Can you post up pics of Forrest in action or of the car he was using? I'm digging all the paint jobs this year! The Japs got it going on! Love the 13b corolla! A feature later in the season hopefully? There has to be live streaming! anyone knows anything? please! looks like a great event!! loving the Dub-crepe-Van LOL.. thats how we do it!! Morita's AE86 is gorgeous.. even Federico Sceriffo's Team Orange Scooby looks mean.. the 3 cute ladies in 'those boots' make me smile.. especially the small one with the glasses on.. awww.. very cute...but seriously love the coverage!! What's with the masks on some of the spectators? 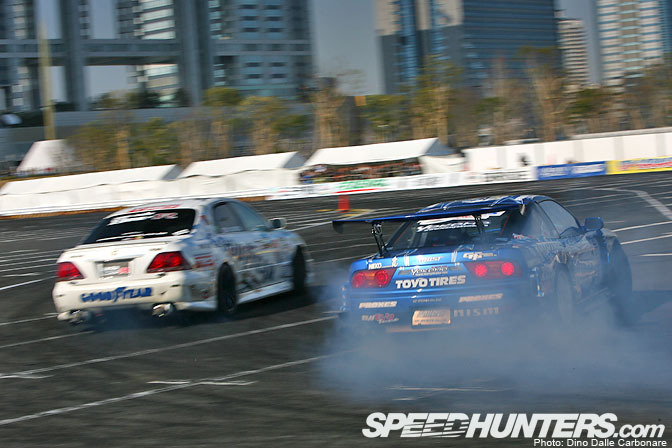 Kawabata toyo tire s15? HUH? is it 2006 or something? They are sanitized masks against alergies or colds, that also help others from catching what you got. Another example of Japanese people's consideration for others. geeez.look how old Inada-san and tsuchiya-san look. is d1 ever gonna come back to cali? was forest driving in this??? Imamura is a BOSS. 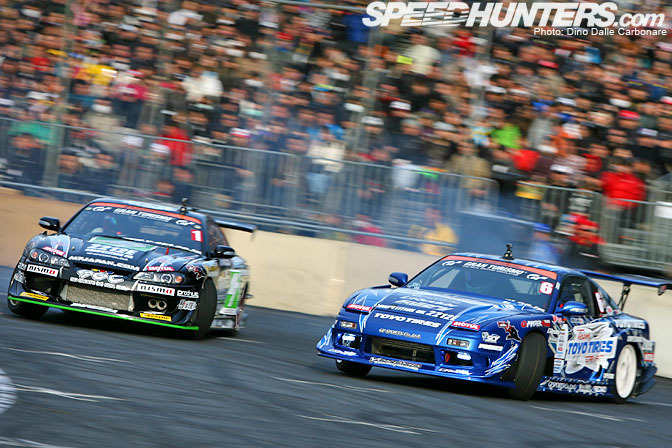 Kawabata was driving the 180sx, or Dino posted the wrong caption for that pic, so no it's not 2006. The difference in quality between D1 and FD cars is amazing. I was just browsing through the FD tech post, now through this one. FD cars going INTO the season look like they just finished one. Need to see Forrest action shots too. Good pics and words Thanks for the cool coverage. hy guys,Kazama has no longer the kei office silvia S15?? ?is he driving this year?what is his cars? ?